Texas State Optical, Fall Creek is conveniently located in Park Lakes Landing, located on Beltway 8 and Wilson Road in the Fall Creek area. Our office is open 6 days a week to accommodate your schedule. 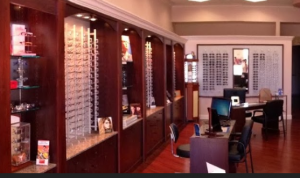 Call us to make an appointment with Dr. Chen to discuss your eye concerns and eyewear needs. We also welcome you to stop by our clinic anytime to browse through our diverse selection of designer eyeglass frames and sunglasses. Located within minutes of the Fall Creek, Park Lakes, Summerwood, Sunset Ridge, and Eagle Springs communities, Texas State Optical Fall Creek is committed to providing caring, convenient services to you and your family. 1. Travel on US-59 until you reach Beltway 8. Take the ramp towards Beltway 8 East. 2. If you do not have an EZ tag, exit Mesa Road (first exit) and continue along Beltway 8 frontage road until you reach Wilson Road. If you have an EZ tag, continue on Beltway 8 East and exit Wilson Road (second exit). 3. Turn left on to Wilson Road. 4. Take a right into the Park Lakes Landing shopping plaza on the right-hand side. We are located in a two-story building behind Denny's. If you are experiencing a medical emergency, please call 911 immediately or head to the nearest emergency center. Please note: Practice is open every other Saturday.